Please see map. We drive 5 hours per day and in total 1100km. Please keep luggage to a minimum – no trailers allowed. We are escorted by a SANPARKS game ranger in own 4×4. 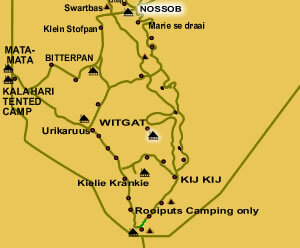 We leave Upington at 8H30 from your guesthouse to drive to the Kgalagadi Transfrontier Park. Stop en route at the Norokei Salt Pans (natural salt mine) and the Khomani San Bushmen to view their art. Arrival at Twee Rivieren 13h00. We depart on a game drive (speed limit 50km/h) in this 38 000 square km park until the gates close. Wake up one hour before gates open. Breakfast, then pack for Game drive in the dry river bed until Kij Kij where 4×4 trails starts. 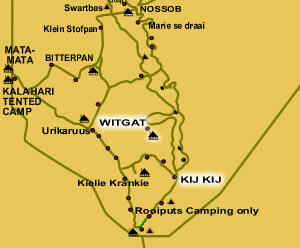 Witgat is close to a waterhole situated in the red dunes. Drive through sand dunes, with various view points, Aardwolf den and sociable weaver nests. Early morning departure on the trail, we stop at a Suricat den and investigate Bushmen Historic site. Wake up one hour before gates open, pack up and depart direction South. Today we learn more of the Kalahari and her secrets. 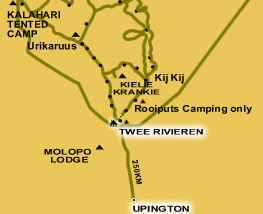 After 4 – 5 hours of game driving we reach Twee Rivieren (12h00) Depart for Upington. Late afternoon arrival at your guesthouse. Tour ends. 30% deposit needed for tour confirmation, and balance cash on day of departure.